Kit out your pole for water fed cleaning with the following ready-made kits. Reinforced pole hose for running up the inside of a water fed pole or the exterior of an extension pole, angle adapter for joining your pole to your brush and adjusting the angle, and pole hose valve for switching the water on and off without having to go back to your water source. Please note, kits do not come with brushes. Pole Hose Kit with 15m pole hose. Note: The kit does not include brush. 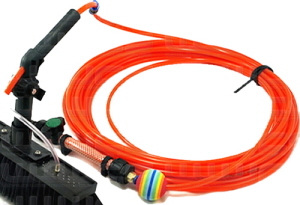 Pole Hose Kit with 20m pole hose. Pole Hose Kit with 25m pole hose.